The Isle of Man TT is fully underway with qualifying already in full swing on the Manx isle. If you’re making the trip over to the Isle of Man then you’ll love our free map. 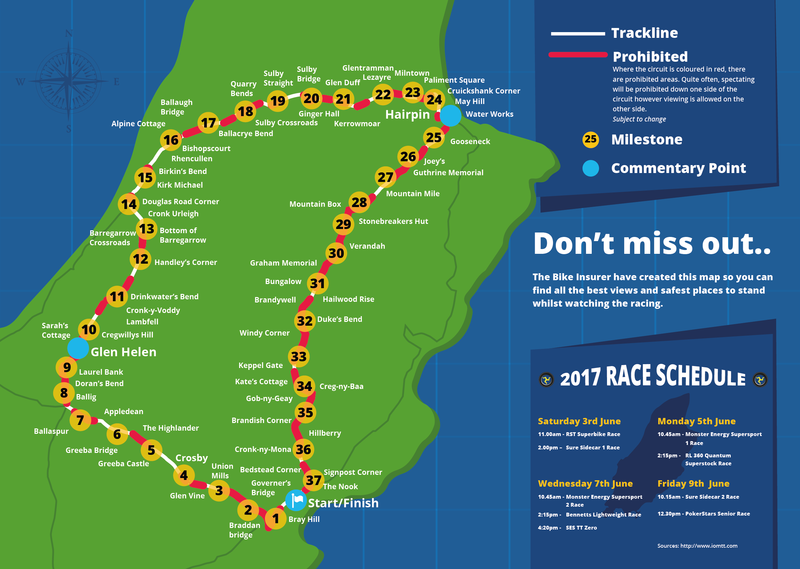 It shows you the full TT circuit, famous corners and milestones along the way, as well as places you can watch all the races unfold. As you’ll no doubt become aware when you get there, motorsport is dangerous and as a result there are lots of places and areas along the circuit where you are not allowed to watch the race from for safety reasons. We’ve outlined these areas on our map so you know where you can and can’t spectate from with a big red line. It’s worth remembering that this red line shows where there are prohibited viewing areas however they may not apply to both sides of road. And if you want to learn a little bit more about the world’s most famous road race, take a look at our Isle of Man infographic.